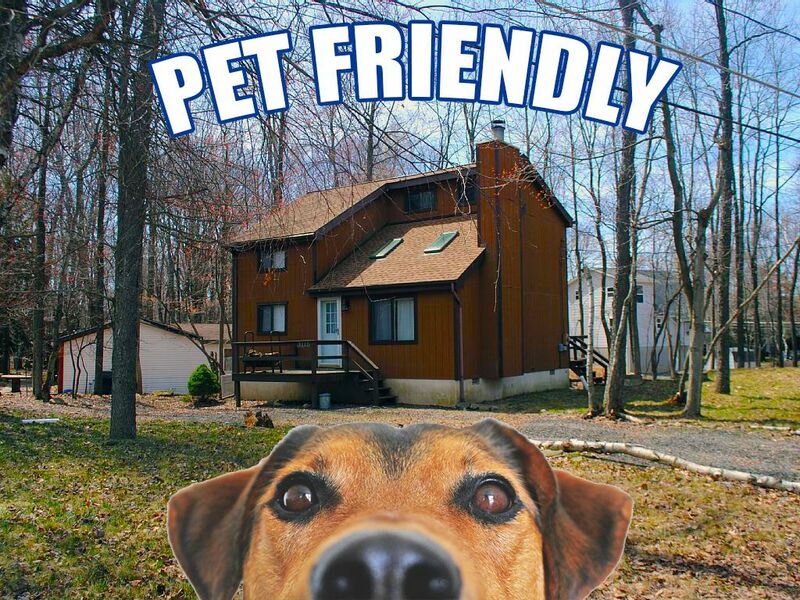 Pet Friendly on a Quiet Road Tucked in the Back of Arrowhead Lake! Enjoy The Poconos! Enjoy a modest, affordable, and exciting family or couple’s vacation at the lake! Retreat to Hiker’s Hallow, the ideal destination for families, friends, and purrfect for fur families! This 3-bedroom 1.5 bath, and pet friendly, sleeps up to 8 people with small additional fee for fur babies! Intimate and cozy, this all-you-need rental has all essentials and just the right amount of entertainment, because you will be spending so much time at Arrowhead Lake! With Amenity badges (children under 12 aren’t required to have a badge!) and the 3 heated outdoor pools, community center, outside sports, biking, hiking, and exploring the natural area, this home provides all the perks of a rental with an awesome price and activity atmosphere. This vacation destination is a short drive to the community amenities AND area attractions! The area is home to many natural lakes, rivers, dams, hiking trails, natural wildlife, enjoy this all-you-need accommodation while you take advantage of our amenities! Hiker’s Hallow is an all you need rental to provide an exciting local experience in The Pocono Mountains! This home is 1000 Square Ft, with 3BR 1.5 Bath. When you enter you notice a modest living room that flows into the kitchen and dining areas. The kitchen includes full appliances, refrigerator, dishwasher, stove/oven, microwave, and cooking utilities. You can prepare a delicious and memorable meal and bake a mouthwatering cake in our oven! This rental is the perfect size for families looking for a modest vacation, providing just the right amount of accommodations, as you will be spending A LOT of time at the lake, the 3 outdoor heated pools, biking, fishing, and checking out the local Pocono Mountain life and attractions! This home is private, secure, and amazing value for the accommodation! Each season has a unique season in The Poconos! You will “FALL” In Love with The Poconos During September, October, and November! The unique blend of reds, yellows, and oranges make for scenic photo opportunities during this time of year. This is an excellent opportunity to generate unique and breathtaking photos for your social media followers! In the summer, there is a grill to BBQ juicy summer burgers, hot dogs, and more summer favorites! Enjoy the relaxing summer nights with friends and family with the scenic ambiance of nature. All summer rentals include amenity badges to the lake and pool making summer vacations relaxing and fun and you don’t even have to leave the community! Who doesn’t like summer vacation photos? Arrowhead Lake Community is a gold star gated community that is private and secure. Life at the lake provides access to family amenities in addition to natural and peaceful surroundings. Arrowhead Lake has 3 heated outdoor pools, sports, fitness center, fishing, boating, and more! Hiker’s Hallow is conveniently located by many of our natural, local, and exciting area attractions only minutes away from this home! Some of our local attractions include golfing, skiing, waterparks, shopping outlets, dams, rivers, and hiking trails! This property is in quiet location perfect for solitude and escaping from the noise of the city. Linens are provided. If used, you must wash/dry/fold prior to departure. Failure to do so will result in a loss of your security deposit. Cozy, with comfortable couch, fire place; connected with kitchen and dining room. Cozy, all you need kitchen! Easily entertain around the dining room, kitchen, and living room. We had a great time over Labor Day. The house was clean and plenty of room for the kids to hang out in the upstairs loft to have their own good time. Kitchen was well stocked. The dog had a blast too! Thanks! House was perfect. I rented for a ski group and it was everything we needed. Very smooth rental process. Mt. Airy Casino - 30 minutes!